The software to decode realtime MinXSS telemetry is publicly available for Windows and Mac and is open source so that the code can be run in Python on any platform (macOS, Windows, Linux). You can get it here. It’s been in use by several HAM operators around the world, including Virginia, Japan, Australia, and the Netherlands. The software can connect to either a TCP/IP socket (e.g., to a software defined radio) or a serial device (e.g., TNC via USB). 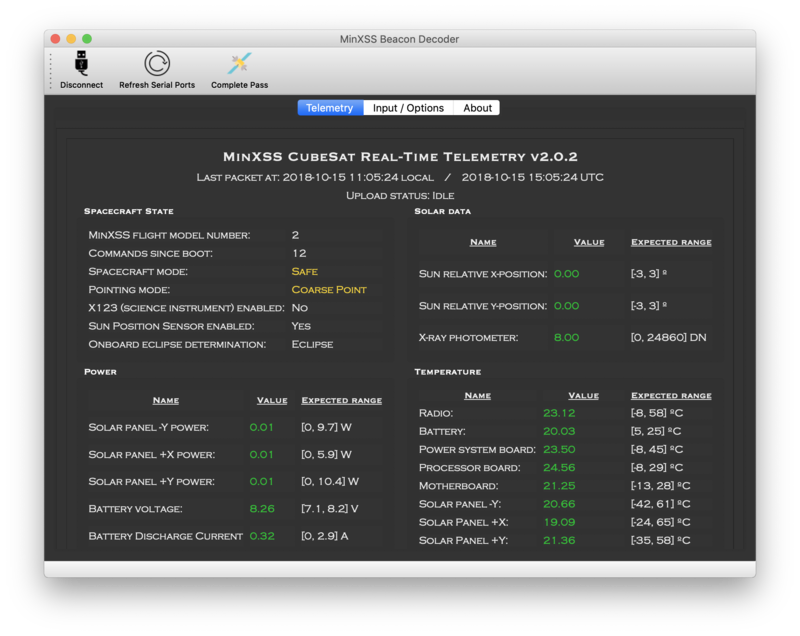 It will interpret the data encoded in the beacon, display some of the real-time housekeeping of the spacecraft (temperatures, voltages, currents, etc) and automatically forward all received beacons to the MinXSS team. That automatic forwarding can be turned off with a checkbox in the Input/Options tab. We encourage other CubeSat teams to fork the source code on github and adapt it for their telemetry. Many thanks to the worldwide radio community for the beacon packets already forwarded to us! Below you can see how many MinXSS-2 packets we’ve received from each ham operator since launch. You can also see the approximate locations of their ground stations on the map, with the size of the bubble scaled by the number of packets received. We update these plots every hour as more beacons come in through the above decoder. Note: we’re still working on an autonomous system to grab data from the SatNOGS database, which is where telemetry from the DK3WN decoder goes (link to download that decoder). At present, that database doesn’t log the callsign or location of the ham operator who collected the packets, so we can’t yet include those in our competition statistics below. There’s an active feature request for that though, so go upvote it if you’d like to see data from SatNOGS included in our competition stats!